Website Creator is a stand-alone website builder product built & sold by InMotion Hosting, one of the largest independent web hosting companies in the world. See Website Creator Plans & Pricing here. InMotion Hosting has been in the web hosting business since 2001. Unlike many hosting companies, they remain staunchly independent and focused primarily on website products for small businesses. They have an emphasis on customer support and raw performance. While they still have a range of hosting products (my InMotion Hosting Review), they have also been quick to respond to changes in customer demand. Website Creator came out of that effort. The big demand of the past 5 years has been for easy to use, bundled, drag and drop website builders. But popular website builders pose some risks for business owners investing in a long-term project. Website Creator was created for small business owners who need to easily DIY their own website, but also are thinking seriously about how to best build their website for scalability, versatility, and long-term success. Since I’ve been a user of InMotion’s hosting products for quite some time, I recently decided to give their new website builder, Website Creator, a try for a small, quick project. Before I dive into pros and cons, let’s talk about some basics. Disclosure – I receive customer referral fees from companies mentioned on this website. All data & opinions are based on my professional judgement based on my experience as a paying customer or consultant to a paying customer. Imagine website builders on a spectrum of convenience and control. On the maximum convenience end, you have Instagram. It’s super-easy to use. But you have zero control over how your account design or function. On the maximum control end, you have a server that you own an operate. You hand write all the HTML & CSS. It offers maximum control, but zero convenience. Most people tends toward to the middle options. Self-hosted WordPress is software that you install on your own hosting account. It has a learning curve, but offers a lot more convenience while still providing total control over your files & server. Wix is a popular drag & drop builder that has much less of a learning curve & more convenience than self-hosted WordPress. But they also have to limit data exports & your server access. Some small business owners don’t like either tradeoff – and that’s the slice that Website Creator is focused on. I’ll get to this in the Pros & Cons, but Website Creator is actually built on top of WordPress on a hosting account that you own. So even though it has the drag & drop and streamlined website launch of a popular website builder, it’s still creating actual files on an actual server that you can access and export should you ever need to grow or rework your website. In other words, think about a single-family home, a condominium, and a townhome. Self-hosted WordPress is a single-family home where you own & are responsible for everything. Hosted website builders are like a condominium where you own everything within the walls but outsource the rest to the Condo Owner’s Association. Website Creator tries to be like a townhome. You have contracted landscapers, plumbers, and a Homeowners’ Association, but when it comes down to it – you still own the land and the structure. With all that said, here are some of the Pros & Cons of Website Creator as a general website solution. Here’s what I found to be the pros of using Website Creator, not just compared to Site123 and Gator, but as a website builder in general. Website Creator’s biggest pro is the fact that it combines convenience and control — which is typically where business owners have to make a trade off when it comes to website builders (even the best ones). Website Creator is actually a bundle that combines hosting (on InMotion), a website software or CMS (WordPress), and a drag & drop tool (BoldGrid). Which means when you sign up for Website Creator, you’re actually getting a self-hosted WordPress website with an installed drag-and-drop website builder (and tons of base templates to use) that you fully own and that any developer or marketer can work with. You don’t have to go piecing all the elements together or put off getting started until you have the “right” web designer. You can just DIY and rest easy knowing that when the time comes, you can upgrade your content, design & marketing as your business needs. Again, Website Creator does a great job of giving users control — and that includes ownership. Now, when it comes to website builders, I generally think of website ownership in 3 ways. The first point is brand asset & copyright ownership. There is no website builder that would ever be able to “own” your website. Not even Instagram does that. If you author the text, images, video, logos, etc. then you own the copyright. But when it comes to the other two points of ownership, not all website builders are created equally. The second facet of ownership revolves around “website look and feel”. Websites are simply files that a browser can render. The look and feel is inherently not only your content, but also the combination of actual files used to render your site. This is where ownership gets tricky. Some website builders do not give you access or copyright to the actual files that are generated with your content. Some give you copyright and limited access. Some give you full copyright and full access. Why would you need full access? Well, let’s say you want to sell or move your website to another provider. If you do not have access to the actual CSS files or actual JS files, then you cannot sell or transfer the site exactly as it currently is. And the third point is practical ownership. So even if you own your entire website – JS, CSS, HTML, images, text, etc – if you cannot download it to your computer or transfer it to another server… do you truly own it? This gets tricky. It doesn’t really matter, until it does. If you have a 10 page website for your dental office, this point really doesn’t matter. But if you are building a reference site for your organization that will eventually have thousands of pages… then it could matter a lot. In Website Creator’s case, your site’s files live on an actual server that can be accessed and downloaded. Which means you have full ownership in all three facets — a great feature if you think you’ll ever need to move or recreate your website elsewhere. Another pro of Website Creator is that once you’re set up, it’s fairly easy to use. As I mentioned above, Website Creator uses BoldGrid, a website builder, to actually create your website. BoldGrid isn’t technically drag-and-drop. You don’t actually “drag” elements and drop them where you want them. Instead, BoldGrid uses Inspirations, which serve as your base template. From there, you can add or remove pages, customize the branding (i.e. colors and fonts), or even go so far to add widgets on individual pages. The range of customization here is extensive. Given Website Creator uses WordPress, you can also install plugins (pieces of software that “plug in” to your website to add functionality), so you essentially create anything you want – that includes things like ecommerce, SEO, appointments, and flying unicorns. But if you’re trying to keep it simple, BoldGrid’s Inspirations (and customization options within them) provide enough flexibility that you can create something that feels custom without having to totally build something from scratch. And speaking of customization… the ability to add integrations through plugins is a HUGE pro for using Website Creator. Given WordPress is the most popular CMS platform out there, the integrations are practically limitless. Chances are, there’s been a plugin created to do whatever you need your site to do. And if it hasn’t been created yet, there’s a developer out there who could probably get it done. Additionally, since you have an actual hosting account running Website Creator, you can integrate with any business email service or analytics package that you need. Depending on your needs, this could be a pro or a con. Signing up for Website Creator does take some time. They actively try to weed out spam users, which means they review accounts before granting access. Their sign up process says it should take a few minutes to get a confirmation email, but after about an hour, we had to reach out to support to get our account approved and up and running. The pro here is that you’re dealing with a company that take its software seriously and actively tries to maintain the integrity of it. They don’t let spammers in, and their customer service department is more than willing to expedite the process if you reach out and explain how you plan to use your site. It’s rare that you get so much flexibility in an all-inclusive website builder, but Website Creator certainly gives you more than any other. The best example of this? Website Creator actually lets use WordPress themes / custom themes outside of BoldGrid. This essentially means that you have a totally customizable, self-hosted WordPress site with the *option* to use an all-inclusive website builder that has pre-built themes and easy-to-use customization options. It’s a win-win. With InMotion, they cover all the bases. From the moment your account gets approved, you’re given instructions on how to finish your account set, start your website, and get up and running. The account dashboard is refreshingly simple. They also offer training inside WordPress, so you can learn how to use BoldGrid and customize various elements. Yep… it can be a con that Website Creator takes time to actively weed out spammers. Why? Because this means the sign up process is slower. Cumulatively, it took about two hours for us to get our account up and running — which isn’t great if you’re looking for a quick and easy solution to get a website up ASAP. Once you get through the sign up and installation process, using BoldGrid is simple (plus InMotion offers a TON of resources to help you through the process). But that doesn’t change the fact that getting up and running with Website Creator isn’t very intuitive. The sign up process is more extensive than most all-inclusive website builders, as is the installation process. For example, before even getting started, you must have a domain name. There’s no option to use a free subdomain to get you up and running like you can with WordPress.com. After that, you have to install BoldGrid, which then brings you into WordPress to edit. Again, the training provided by InMotion is stellar — but you do need to take the time to read it. Popular pure-play website builders like Wix, Weebly, Squarespace, Shopify – and even GoDaddy GoCentral all have in-screen on-boarding to show you how to do things while you build it. If you’re looking to just dive on in and figure it out without having any website building experience, Website Creator probably isn’t the best solution for you. Website Creator does come with a learning curve, but it offers a ton of customization, flexibility, and ownership for users. Plus, it gives you the best of both worlds: a self-hosted WordPress website without the hassle of tracking down your hosting, website builder, and CMS. Check out Website Creator’s plans here. However, there are trade-offs to consider here. 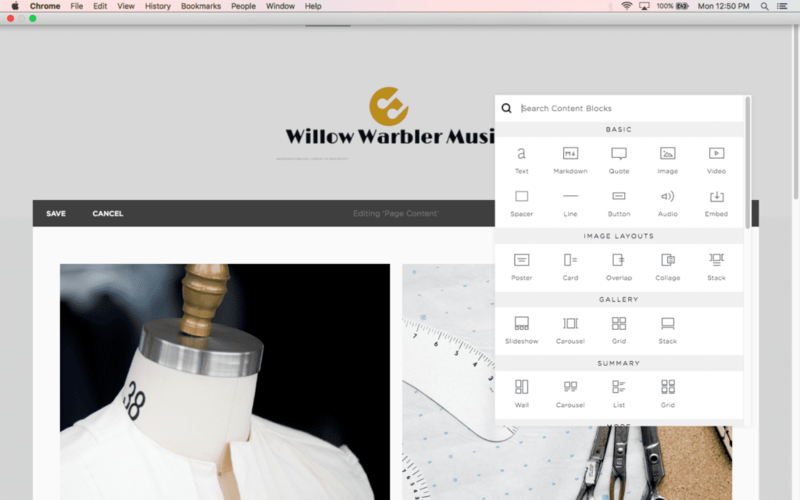 If you’re looking for a quick, easy, intuitive website builder that you can use to throw up a quick project, Website Creator probably isn’t the best choice for you. Instead, check out my quiz to find what the best website builder is for you based on your preferences. The post InMotion Hosting Website Creator Review: Pros, Cons & Alternatives appeared first on ShivarWeb. Jimdo is known as an easy-to-use, all-inclusive website builder that is designed for people with no coding knowledge. They offer two options for website owners: a DIY builder that puts you in control of choosing a template and customizing it, or an AI website builder that uses artificial intelligence to build a template for you, then walks you through the various tweaks you can make. Recently, I gave Jimdo a try for a full Jimdo review. But before I get into the pros and cons of my Jimdo review, let’s dive into an overview about tools to build a website. On the wide spectrum of website building solutions, Jimdo lives on the end that is all-inclusive and provides everything you need to get started and grow your website. It contrasts with solutions where you buy, install, and manage all the “pieces” of your website separately (ie, you buy a domain, hosting, and website software separately.). Using Jimdo is sort of like leasing and customizing an apartment in a really classy development instead of buying and owning your own house. You’re still in control of decor, cleaning, and everything living-wise – but you leave the construction, plumbing, security, and infrastructure to the property owner. That point is key because there’s usually a direct tradeoff between convenience and control. Everything may fit together just right with a website builder like Jimdo, but that may or may not be what you’re looking for. As far as competition, Jimdo competes with all-inclusive website builders like Weebly, Wix, Squarespace, and WordPress.com. Compared to their direct competition, they focus on using AI to create done-for-you templates and designs so you can focus on plugging in your content and getting up and running quickly. They also offer a more traditional drag-and-drop builder for those who have more experience, making Jimdo appeal to beginners who have no design or development experience (think DIY-ers who need to create a website ASAP without having any website experience) and those who have a bit of website knowledge and want more customization abilities. Here’s what I found to be the pros of using Jimdo — not just in comparison to popular website builders like Weebly and Wix, but as an overall website solution. Jimdo is also seriously simple to use, which makes it hard to mess up your website design. Once you choose a template (or have one created for you with the AI builder), you’re pretty much locked in to the layout provided. The DIY website builder is drag and drop, but it has it’s limitation — you can add new elements to the page, but only within the template structure you’re already given (and limited to the elements provided — but more on that in a bit). Or, you can take the DIY-approach. In this approach, you select your industry and are provided with a selection of website templates to choose from. Then, you can customize the template with Jimdo’s drag and drop editor. This method is slightly more advanced, but still straightforward and controlled enough to keep newbies in check. One thing to note if you’re going the DIY route — I found that your industry selection doesn’t matter. I was given the same templates to choose from whether I chose business or healthcare or skipped the industry question all together. *One additional note here. When using Jimdo for the purposes of this review, I created an additional Jimdo account through a new browser window to go through the sign up process again, and was automatically assigned to the AI website builder. Of course, there’s always a chance for user error, but as a brand new, inexperienced customer to the platform… it was confusing. It’s a potential con for using the platform, but not because of the actual user experience of the builder — it’s just a bit confusing and unclear when signing up. Jimdo’s pricing and plan structure is a bit confusing. When first signing up, You can see that paid plans start at $9/month paid annually, which includes your own domain, free hosting but only a 10 page limit. Their free plan doesn’t even offer mobile-friendly site design (a pretty standard design feature in today’s world), and you can’t get basic Search Engine Optimization features until their mid-tier plans. Even the mid-tier Grow plans has hard limits on the number of pages and on bandwidth usage (which to me seems like a double-limit). And I’m all for over-delivering on low expectations, but the support options are seriously deficient. Plus, there’s no option to may monthly, so you’re locked in for a year. And you can really see this trade-off with the Jimbdo website builder. The convenience of their design setup is great. It’s straightforward, fast, and not confusing at all. It puts your focus solely on getting your content onto the premade template and adding additional elements within the template that may enhance your design / user experience. If your website is growing, or becoming a bigger part of your business, the design limitations can be crippling.And unlike other website builders that attempt to solve this issue through apps, extensions, or access to the website code or HTML, there is no outlet for a Jimdo website builder website. These are things like integrations with Facebook, Pinterest, Twitter, Google Ads, social sharing options, blogging, and a whole host of every intermediate to advanced marketing tools on the internet. Now, as I mentioned above, Jimdo does give some integrations, like ecommerce and DNS/hosting services. However, there are a ton of technical features that Jimdo doesn’t provide or that are extremely limited. For example, let’s look at Jimdo’s SEO features. I can edit the page title and description for individual pages, as well as assign noindex, nofollow, or noarchive settings. But aside from that, I’m pretty locked in to what I have aside from editing the HTML in text sections on the page. There’s no options for sitemaps, Schema, Open Graph settings – much less highly advanced options. Even the additional add-0n products are limited. There’s not much to address marketing your site, aside from adding code for Google Analytics and Facebook Analytics. Ultimately, Jimdo leaves much to be desired when it comes to product integrations and additional technical features that can help you better market your website. Jimdo certainly makes getting a website up and running easy, especially if you need something that’s done-for-you and requires little customization (just choose their AI website builder). They have a straightforward user-experience and easy-to-use editor/customizer that makes getting your content out there a breeze. Check out Jimdo’s plans here. However, there are trade-offs to consider with an all-inclusive website builder — specifically functionality, customization, and control. And this is where Jimdo falls short when compared to other all-inclusive website builders. They’re severely limited when it comes to technical features and integrations, which means if you’re looking to create a website with a base template but still have some flexibility over functionality and enhancements, Jimdo may not be the best option for you. Not sure Jimdo fits your needs? Check out my quiz to find what the best website builder is for you based on your preferences. The post Jimdo Review: Pros & Cons of Using Jimdo Website Builder appeared first on ShivarWeb. Site123 is a fast-growing, independently-owned, website builder based in Israel focused exclusively on DIYers. They claim to be “the most intuitive and easy to use website builder on the market”. Recently, I gave Site 123 a try for a small project after receiving a few reader questions. But before I get into the pros and cons of my Site 23 review, let’s consider a bit of background on building a website in general. On the wide spectrum of website building solutions, Site123 lives on the end that is all-inclusive and provides everything you need to get started and grow your website. It contrasts with solutions where you buy, install, and manage all the “pieces” of your website separately. I wrote a post on Website Builders, Explained for more background. Using Site123 is sort of like leasing and customizing an apartment in a really classy development instead of buying and owning your own house. You’re still in control of decor, cleaning, and everything living-wise – but you leave the construction, plumbing, security, and infrastructure to the property owner. That point is key because there’s usually a direct tradeoff between convenience and control with all software, but especially with website builders. Everything may fit together just right with a website builder like Site123, but that may or may not be what you’re looking for. As far as competition, Site123 competes with all-inclusive hosted website builders like Weebly, Wix, Squarespace, Gator, and WordPress.com. Compared to their direct competition, they focus on speed and ease by providing done-for-you templates and designs so you can focus solely on content. Instead of operating like a traditional drag-and-drop website builder, Site123 has you pick your niche and then customize a curated template based on that niche, which appeals to beginners who have no design or development experience (think DIY-ers who need to create a website ASAP without having any website experience). Here’s what I found to be the pros of using Site123 — not just in comparison to other website builders, but as an overall website solution. One of Site123’s best features is how quickly you can get up and running. Signing up for the platform is a simple, three step process (hence the name Site123), and it’s straightforward, easy to understand, and efficient. Plus, Site123 builds in education through a simple, step-by-step tutorial that walks you through how to customize your assigned theme and add content to your website, which is an excellent feature for users who haven’t customized / built a website before. Site123 is also seriously simple to use. As I mentioned before, Site123 provides you with a template based on your selected industry and type of business/website within that industry. While the website builder is not drag and drop, you can choose from a menu of page elements to change the design within your selected theme. The site layout is mobile-friendly and maintains an acceptable look/design no matter what you do to the design options. Another benefit of Site123 is their extensive list of product integrations. Aside from offering DNS and hosting services, Site123 also offers several plugins (software that you can “plug in” to your website to get additional functionality). From advertising software to analytics tools to marketing + support, their library is extensive. Site123 also offers ecommerce functionality. One thing to note here though — to use the integrations, you have to have a paid plan. And to get ecommerce functionality, you have have to choose between the two higher-priced tiers. We’ll talk more about pricing in a moment, but just know that you could get the same (or better) functionality for less elsewhere. Site123’s paid plans start at $10.80/month, which includes a free domain for a year/the ability to connect your domain, 10 GB of storage, 5 GB of bandwidth, and the ability to send 100 email messages (side note – who counts email messages?) to your mailing list per month. It also removes the Site123 branding that comes with the free plan. But compared to their direct competitors like Wix and Weebly, Site123 is much more expensive and offers much less. At each stage, Site123 doesn’t even allow unlimited bandwidth or storage. And compared to self-hosting (piecing domains, hosting, and email separately) – it’s not a good value at all. If you’re using Site123 for more than a few months, it’s going to be more expensive than going with a competitor (and more restricting due to the design and technical limitations – more on that shortly). And you can really see this trade-off with the Site123 website builder. The convenience of their design setup is great. It’s straightforward, fast, and not confusing. It puts your focus solely on getting your content onto the premade template by generating a curated template for you. But here’s the thing — if you don’t like the template you’re given, changing it up is a pain. If you want to go anywhere beyond the basics of design, you are very limited with Site123. For your theme, you can edit the color, the font, and the general ‘feel’/structure of the design. With pages, you can choose certain layouts from pre-made choices. But you cannot change the layout. You cannot drag and drop. And you certainly cannot edit the HTML and CSS, much less add any other design element. It’s even difficult and near impossible to edit the menu without changing other design elements on the website. If your website is growing, or becoming a bigger part of your business, the design limitations can be crippling. And unlike other website builders that attempt to solve this issue through apps, extensions, or access to the website code or HTML, there is no outlet for a Site123 website builder website. The limitations on design also bleed over into technical limitations. Technical limitations are features and functionality that you don’t know that you want until you want them, and then you find out you can’t have them. These are things like integrations with Facebook, Pinterest, Twitter, Google Ads, social sharing options, blogging, and a whole host of every intermediate to advanced marketing tools on the internet. Now as I mentioned above, Site123 does offer additional features through plugins and apps, but due to the control you give up with the website, you’re fairly limited in how much you can integrate, add on, or even edit within the tools provided. For example, let’s look at simply editing SEO elements on a page. With the Site123, I can add in a meta description and site slogan, but that’s about all I can do aside from adding header tags inside the content editor. Even basic SEO needs more than that. Think of it like the difference between cooking in your own kitchen and building your own burrito at a fast food restaurant. With Site123, you can certainly choose the ingredients that go into your burrito, but your choice is really an illusion because you’re limited to the ingredients that are offered by the restaurant. Like the design, that can be a good thing if you need something simple, and will always need something simple. But if you ever need to upgrade or do something unique or custom, it can be very limiting. After looking at a lot of companies across domains, hosting, VPNs, website builders, ecommerce, and more – I’ve noticed that company culture, structure, and policies can speak more about a customer’s long-term experience than a feature matrix. A website builder is inherently a global business. Every Internet company has remote employees and worldwide data centers. But I’m never a fan of companies not sharing their story or what they are all about. Site123 is incredibly vague about their story, their policies and your relationship to them as a customer. For example – here’s their about page. Now – I get that they are a free, hosted website builder. Most website builders have trouble with website export. But their messaging is quite stark with no offer of help scraping or downloading even image files and text. And the cancellation policy is very odd because it conflicts directly with the purported difficulty of providing a website download. A hosted website builder service should be able to be cancelled at a click of a button. There should be no manual reviews of forms. Again – this point isn’t meant to raise a potential non-issue for no reason. Site123 might provide a fantastic long-term experience. However, difficult cancellation policies and vague about pages tend to correlate with less than ideal long-term experiences. Site123 certainly makes getting a website up and running easy, especially if you need something that’s done-for-you and requires little customization. They have a straightforward user-experience and easy-to-use editor that makes getting your content out there a breeze. Check out Site123’s plans here. However, there are trade-offs to consider with an all-inclusive website builder — specifically functionality, customization, and control. And this is where Site123 falls short when compared to other all-inclusive website builders. If you’re looking to create a website with a base template but still have some flexibility over design and functionality, Site123 may not be the best option for you. Not sure Site123 fits your needs? Check out my quiz to find what the best website builder is for you based on your preferences. The post Site123 Review: Pros & Cons of using Site123 Website Builder appeared first on ShivarWeb. If you’ve arrived at our comparison of Shopify and Etsy, I’m guessing you’re an online seller (or an aspiring one) of the “artsy” or “craftsy” variety. Perhaps even “artsy-craftsy.” Whichever identifier you prefer, you’ll be pleased to know that both Shopify and Etsy can help you sell all sorts of unique, handcrafted, and/or vintage items. By contrast, Etsy is an online marketplace that allows youÂ to set up shop directly alongside other ecommerce vendors, all with a similar artsy and/or craftsy vibe. All the while, Etsy’s involvement in the whole operation is directly front and center for your shoppers. You could also argue that a direct comparison between Shopify and Etsy is quite fair and appropriate. People often wonder 1) which of the two software platforms provides the best starting place to sell online, 2) under what circumstances it makes sense to use one or the other (or both), and 3) at what point a seller might need to transition from Etsy to Shopify. Plus, the introduction of Pattern by Etsy a few years ago made the comparison between Shopify and Etsy even more apropos. For a monthly fee, Pattern makes it possible for Etsy sellers to maintain a standalone, inventory-synced site of their own. Sites built with Pattern can even offer additional products and services that don’t meet the handmade/vintage/craft supply restrictions of normal Etsy shops. Pattern aside, a huge draw of Etsy in its original form is the built-in traffic and existing customer base from which you can directly benefit as a seller. (You don’t get that with a standalone Pattern site.) The downside, of course, is that you must share your customers with similar stores. So, with Pattern thrown in, can Etsy compete directly with Shopify? Does the magic combination of Etsy and Pattern render Shopify completely unnecessary for some Etsy-type sellers? You can already tell from our chart at the top of this article that we are still fans of Shopify, but we think all sellers should understand precisely how these two services stack up on all the important dimensions. Ultimately, the right fit is up to you. Despite some overlap, there’s no getting around the fact that Shopify and Etsy have very different pricing structures. The differences are significant enough that we can’t call a clear winner for cost. Sellers who are just getting started, are very concerned about cash-flow, and simply can’t afford a monthly subscription fee will find an initially cheaper option in Etsy. Once you have a moderate and fairly predictable stream of transactions and need a full website for your store, Shopify starts to become more cost-effective. That’s the condensed version of our pricing comparison. For the full breakdown, strap in and keep reading! When comparing these two platforms, you should first wrap your mind around the main categories of fees involved. It will also help to keep the following overarching difference in mind: Shopify’s main charge is a monthly fee for using the service, while the main component of Etsy’s cost is a fixed 5% transaction fee charged on every sale that occurs on the platform. Monthly Fee: Subscription fee for using the platform. Listing Fee: Cost of listing a product (or group of products that make up one listing) in your shop. Transaction Fee:Â Percentage commission per sale charged by Etsy or Shopify itself. Payment Processing Fee:Â Not the same as a transaction fee!Â This is a per-sale fee (usually a percentage and a dollar amount) charged by your credit card processor/payment gateway. While this entity is usually a third-party company, it turns out both Etsy and Shopify have an in-house, pre-integrated option that most sellers use (Etsy Payments and Shopify Payments, respectively). Standalone Website:Â Cost of having your own, hosted website with a customizable theme template. Let’s take a close look at the numbers, shall we? All prices will be shown in USD. Shopify plans have a monthly fee, no listing fee, and a variable transaction fee that only comes into play if you do not use Shopify Payments as your credit card processor. Starting at the $29/month level, you get your own store website. This involves choosing a free Shopify template or purchasing a premium template from the Shopify theme store. As you look through Shopify’s five pricing plans, remember that you can completely avoid Shopify’s extra transaction fee if you use Shopify Payments as your credit card processor. Standalone Website: Unavailable. Sell on an existing website, Facebook, or in-person only. Standalone Website: Included. Templates are $0-$180/ea. Shopify Plus:Â Custom pricing.Â Reserved for enterprise-level customers. With each bump in subscription level, Shopify sellers have access to additional features, as well as more staff accounts for their stores. Check out our full Shopify review, or our quick guide to Shopify pricing, for a more complete breakdown of features by plan. Etsy has two main plans — Standard and Plus — and a Premium plan that will launch sometime in 2019. Most Etsy sellers use the Standard plan with no monthly fee, whereas the Plus plan is $10/month. Other components of Etsy’s cost include a fixed listing fee, as well as 5% transaction fee on every sale. There is no avoiding this 5% fee, even when you use Etsy Payments as your credit card processor. Also, keep in mind that your only web presence is your shop page within the Etsy marketplace. If you’d like your own store website separate from (but synced to) your Etsy shop, you can create and maintain a Pattern site for an additional $15/month. Standalone Website: None, or $15/month with Pattern. Pattern site templates are free. One final note about pricing before we sum up this section: if you want a standalone site built on Pattern, you’ll also need to purchase and/or connect a domain name. The annual cost varies, but should be comparable to purchasing a domain for a Shopify store. Of course, if you stick to just selling on Etsy and not on Pattern, you don’t need your own domain URL. Again, this is one of those comparisons you’ll have to decide the winner of for yourself. You can see that once you have a steady flow of significantly-sized transactions, avoiding that 5% Etsy fee on every sale and ponying up $29/month for Shopify instead (and using Shopify Payments to have the Shopify transaction fee waived) starts to make more sense. Shopify and Etsy stores are both fully-hosted solutions based in the cloud. You don’t need to download or install anything to use either. If you create an Etsy-connected website using Pattern, your site’s hosting is covered by your $15/month Pattern subscription. Similarly, Shopify store hosting is covered by the monthly fee. Shopify deserves the win in this category for accommodating a much wider range of business sizes. For just $9/month, you can start selling on Facebook with no additional transaction fees (beyond payment processing itself) if you use Shopify Payments. From there, Shopify scales all the way up to enterprise-level merchants. Etsy, on the other hand, is better geared toward small to mid-sized operations and doesn’t scale nearly as well. That said, for those who just want to test the ecommerce waters and dabble in selling a few handmade or vintage products, Etsy is ideal. No special hardware or software is required to open and manage a shop on either platform. You do have the option to add hardware (like card readers) if you wish to sell in-person. Shopify usually earns our top rating for ease of use in the ecommerce software category, and with good reason. In this case, however, I’m awarding Etsy the narrow win. As a marketplace with a uniform structure across all web shops on the platform, the whole Etsy setup process is much less open-ended, so it’s easier to start selling right away. Once you fully dive into the admin dashboard and start manipulating individual features, however, I think the two platforms are equally easy to use. Let’s peek inside the setup process and backend structure of each system, so you can see what I mean. Shopify offers a two-week free trial of the platform — all you need is an email address. You’re free to test the software to your heart’s content, short of making actual sales. In addition to configuring products and setting up the rest of the backend of your store, you can work on customizing your online storefront at the same time. We’ll have more on this process in the Web Design section. While Shopify is easy to use, you are ultimately responsible for locating and configuring all the settings (shipping, tax, billing, etc.) to get your store going. The cookie-cutter look of Etsy shops is no accident — it’s achieved through a simple, highly-controlled system behind the scenes. In fact, Etsy guides your hand to such a strong extent that by the time you’re taken through the basic setup process, you already have a store that’s up and running. Unfortunately, there is no free trial of Etsy. Instead, you must enter a product, your bank account routing number, your credit card info, and other personal/business details before you can even enter the admin dashboard. Coming from the land of ecommerce software where no-credit-card-required free trials abound, I find this system annoying. However, I can’t deny that it is also very effective. The most detailed piece of the store setup wizard is step three: adding products (a.k.a, listings). As I mentioned, you’re forced to list at least one item before you can even complete the Etsy signup process and see your main dashboard. Below is the third screen from the setup wizard. Yep, it’s long. Click it to enlarge, if you dare. As soon as I was (finally)Â done with the initial setup wizard, my shop was online and ready to sell. I received so much guidance steering me directly to the goal that I almost felt like I was tricked into suddenly having an active store. In a good way, I guess! I’ve focused on getting a store up and running in this section as an illustrative example — there are lots of other components of each platform to consider. As you’ll see in our Feature section below, though, Etsy has fewer features than Shopify overall. This makes it easier to quickly get a handle on the entire software platform’s capabilities and scores Etsy another point for user-friendliness. Still, the ease of going from zero to ready-to-sell is what really puts Etsy on top. Let’s acknowledge right away that comparing the features of Etsy and Shopify is hardly an apples-to-apples endeavor. One is an online marketplace including multiple sellers, while the other is a platform on which to build a website that you ultimately own. Etsy has a specific target market of crafters, vintage resellers, and the like, while Shopify’s merchant pool is much wider. The feature sets of each platform work really well for sellers within their specific contexts. Once we add Etsy’s Pattern to the mix, the comparison gets a little closer, but it’s still slightly unfair to both systems. I do think the best “features” of Etsy have already been highlighted — it’s very easy to get started selling, and you’ve already got a built-in traffic base. Beyond these important advantages, there’s not a lot you can do on the back or front end of your Etsy and/or Pattern shop that you can’t do with Shopify. And, if the core Shopify platform doesn’t have a specific tool you’re looking for, I can almost guarantee you’ll find a solution in the immense app store (more on that later). All in all, I’m giving Shopify the win because I think it’s a more advanced system for ecommerce. Shopify adds several features that Etsy and Pattern are missing, like checkout on your own domain (customers are redirected back to Etsy if they purchase through your Pattern site), manual order creation, a built-in POS system, and bulk product import/export/editing. In addition, many of the features the two platforms share in common are more robust or flexible with Shopify (I’m thinking of their respective discount engines, abandoned cart recovery systems, SEO tools, etc.). Shopify easily wins this category, even after you throw Etsy’s Pattern software into the mix. Shopify’s frontend template options have Pattern’s beat on all counts — the sheer number of options, the variety of styles, and the overall quality of designs. Not to mention that once you’ve chosen a theme, Shopify gives you much more flexibility to perform further customizations. Allow me to illustrate! Shopify offers 70 templates, most with 2-4 style variations. Ten themes are free and supported by Shopify developers, while the remaining third-party themes are offered at $140-$180 as one-time purchases. I think most of the free themes from Shopify outshine Pattern themes, but we’ll get to Pattern in a moment. For now, you should know that Shopify has tools to adjust fonts and colors (via the Theme Editor), and to drag-and-drop page elements up and down your layout (via the “Sections” tool) — all without touching any code. You can also make further adjustments with code if you have those skills, but this is not necessary for the average user. For more information on how these tools work, check out our full Shopify Review. With the $10/month plan, you have a bit more flexibility in your design. For example, you can insert a rotating image carousel in lieu of a fixed banner image across the top. And yet, there’s still no dragging nor dropping allowed. You can also add a few select pages to your site, like an About or Contact page. You just have to be okay with your layout being completely fixed for each page. Even if you wanted to try tweaking the template code, it’s just not an option. Sorry, Etsy. Shopify has some of the best designs and editing tools of all shopping cart platforms on the market, so I’m not surprised that Etsy is completely overshadowed in this area. Pattern is only ideal for the most basic of websites. Fortunately, it does offer a 30-day free trial of a live site (once you’re already signed up for Etsy) if you’d like to test the site builder for yourself. Etsy and Shopify each offer a collection of free and paid add-ons to integrate with your shop. The big difference is in the quantity. Etsy’s selection of a couple dozen apps just can’t compete with Shopify’s approximately 2500 offerings. If you’re worried about the quality of these Shopify add-ons, you have access to thousands of user reviews in the app store. You’re likely to find anything and everything you need to expand your store beyond the core Shopify platform. A large selection is certainly great, but with the important caveat that the vastness of it all could end up becoming too overwhelming, costly, and unnecessary for small sellers. I was happy to see that Etsy at least offers a few well-known accounting and tax integrations (e.g., Quickbooks, Wave, TaxJar, TaxCloud) and email marketing apps (e.g. AWeber, or MailChimp if you use Pattern). You’ll need to decide if you will ultimately need the store expansion capability that Shopify provides, or can settle for Etsy’s offerings. If you set up a Pattern store, you’ll definitely want to add a good SEO integration. Payment processing is a complicated and nuanced topic, so we’ll just cover some basic comparisons. Your mileage on this verdict in favor of Shopify will vary depending on your location, currencies, risk level, etc. We’ve already mentioned that Shopify and Etsy both have their own self-branded payment gateways. Do note that Shopify Payments is actually built on Stripe’s infrastructure, while Etsy Payments is largely powered by Adyen, another big payment gateway company. At any rate, most sellers on either platform end up using these pre-integrated options. Why? Well, even though you have over 100 processor options with Shopify, recall that you’re penalized with a separate transaction fee (usually 2%) if you don’t pick Shopify Payments. Meanwhile, Etsy Payments (formerly Etsy Direct Checkout) is essentially your only credit card processor option with Etsy. The only reason you wouldn’t use Etsy Payments is if it’s not yet available in your location. If you’re not operating from one of the approximately three dozen approved countries, you can only accept PayPal or manual payment methods (like check or money order) that you arrange separately with your buyers. Etsy Payments allows you to accept credit and debit cards, Etsy gifts cards and credit, PayPal (pre-integrated), a few bank transfer services, Apple Pay, and Google Pay. Shopify Payments offers similar options but adds Amazon Pay and Shopify Pay to the mix. Meanwhile, Etsy Payments does allow you to accept a few more currencies than Shopify Payments (Danish or Norwegian krone, anyone?). Below is a quick look at the processing fees for Shopify Payments versus Etsy Payments (shown in USD). As you’ll see, Shopify Payments it the better processing deal, especially as you climb the subscription ladder. Of course, you need to factor this into the larger picture of costs we discussed earlier. An “in-house” payment processor can really streamline this aspect of your business, so it’s nice that both platforms offer one. Neither is a 100% perfect processor for everyone, as you’ll see when we discuss user reviews later. Nevertheless, Shopify Payments comes out ahead because it offers better rates, more payment methods for shoppers, and a native system for in-person transactions. Plus, if Shopify Payments doesn’t work for you, you’ve got plenty of other gateways from which to choose. Not so with Etsy. This particular contest was closer than I expected. Both platforms offer 24/7 email and phone support, but Shopify adds a third contact channel via 24/7 live chat. That’s really the main reason for Shopify’s win here. I know a lot of online sellers prefer this option over email and phone, since it works like a nice blend of the two. Etsy does offer a callback option when waiting on hold, which is very handy. On the flip side, I’d like to see Etsy’s contact number and ticket system more easily accessed from the help center page — it’s much too buried for my taste at the moment. While both platforms also offer great self-help resources such as blogs, forums, knowledgebase articles, and videos, the information for Etsy sellers is mixed in with support resources for Etsy shoppers. This can feel a bit cluttered and confusing at times. I will say that Etsy does go beyond the support of a typical ecommerce platform in a unique and specific way. As a marketplace that gathers lots of merchants together in one place, sellers are automatically part of a built-in community. There’s even an opportunity to join Etsy Teams — groups of sellers in the same location, selling the same types of products, or with other unifying aspects to their stores. Some teams even meet up in real life or organize special events together. While Shopify users can tap into the strong community of developers and merchants offering mutual support in forums, the overall camaraderie can’t compete with Etsy’s community vibe. You also may have more access to seller protections as part of a marketplace, but this can heavily depend on the specific situation. Etsy aims to look out for its shoppers as well! Because Etsy is a marketplace full of buyers as well as sellers, buyer complaints abound. When something goes wrong with a sale, it’s more accessible and more public for a shopper to point a finger at Etsy than the actual seller, even when the seller was primarily at fault. Shopify mostly operates behind the scenes from a shopper’s point of view, so it’s easier to isolate feedback about the platform that’s specifically from store owners. For these reasons, Etsy’s reputation on review sites can be skewed quite negatively, so I can’t make a truly fair comparison with Shopify. Nevertheless, I’ve teased out some seller-specific feedback, just so you can get an idea of the common threads that appear. First, the good. Not surprisingly, Etsy sellers like how easy it is to set up shop. They enjoy access to an existing customer base and the effective site search tools that make it easy for shoppers to find their products. Some users have mentioned their positive experiences with Etsy’s customer service, and the help they’ve received resolving disputes with customers (or even other sellers). Of course, some Etsy sellers mention bad experiences with customer service, saying the marketplace isn’t taking enough responsibility for regulating seller behavior. I found several complaints that Etsy gets away with being a “neutral” party, shifting blame to its users on either end of transactions. At the very least, people are confused about Etsy’s role. Other Etsy shop owners contend that the marketplace is too saturated with similar sellers, and that competition is simply too tough to sustain their shops. Still others have issues with payments or chargebacksÂ or claim their shops were suddenly closed without warning. I’ve also seen plenty of sellers lament the increase in Etsy transaction fee from 3.5% to 5% in mid-2018 — that wasn’t so popular. On the Shopify side, the top accolade is typically its ease of use. Sellers also like the opportunity to add functionality and scale their stores using add-ons from the app store. Shopify’s web design is highly praised, especially among those who appreciate the ability to easily customize their sites without code. Like with EtsyÂ — and many other large software companies — Shopify’s customer support receives mixed reviews. Other common Shopify complaints include the added cost of integrations and the extra transaction fees if you can’t use Shopify Payments. Sellers do sometimes have problems with the payment system itself as well — their funds were held, or their Shopify Payments accounts were terminated due to various factors. If that all sounds a bit scary, understand that a lot of the problems that pop up for Etsy and Shopify are common across the ecommerce world. The good news is that the research you’re doing now will help protect you against some of the more avoidable issues! Etsy and Shopify are both PCI complaint systems, offering site-wide SSL certificates for data encryption. If that all sounded like nonsense and jargon, don’t worry. You should know, however, that part of the reason Pattern websites meet security requirements set out by the data regulatory folks is that your shoppers are directed back over to Etsy checkout pages to complete their transactions. This kind of ruins the illusion that your site was actually your own site, but it does at least help with security. With Shopify, your customers can check out directly on your site with the same level of security in place. Shopify won this battle handily, coming out ahead in most of our individual comparison categories. And yet, I’ll be the first to admit that the one-sidedness of our comparison does not do the key selling points of Etsy justice. The main advantages to Etsy — the ability to get a shop up and running quickly on a shoestring budget, and built-in access to the traffic of an entire online marketplace — are absolutely huge for beginning sellers. If you’re not ready to go whole-hog into selling online and would prefer to test the waters first, Etsy is definitely the way to start. For first time sellers, it’s akin to setting up your craft booth at an established craft fair, versus plopping your stall on a street corner in the middle of nowhere. This is all to say that Shopify only really wins if you’re ready to take responsibility for maintaining and drawing traffic to your own website. You’ll need to learn and implement an effective SEO and marketing strategy, for example. This is no small feat for the budding online seller and should not be taken lightly. If done well, however, any customers you obtain are your own, and this is the big reward that accompanies your efforts with Shopify. Your sales and growth will not be limited by super-direct competition with other sellers within a marketplace. You’ll completely sidestep this major downside to Etsy. When we start talking about actual ecommerce features and web design, Shopify is a more powerful ecommerce tool. Specifically, we’ve seen that Etsy’s Pattern software can’t compete with the standalone storefront-building capabilities of Shopify. For most sellers who are ready to launch their own websites, I’d suggest skipping over Pattern and heading for Shopify. Yes, a Pattern subscription is cheaper than Shopify, but it seems like too much of an intermediate, half-way step that won’t get you fully where you want to go. Besides, there’s no reason you can’t keep your Etsy shop open in the meantime as you grow your Shopify-based store — and, you could ultimately connect an app to sync up your inventory between the two. Etsy could then become one marketing channel of many for your main online store’s top products. Something to consider! I think if you’ve made it this far, you’re probably ready to at least test the capability of Shopify with a free 14-day trial. Of course, if you’re already an Etsy seller, you can also play around with Pattern’s tools for free before even connecting a domain and going live with your site. Since you’ve got nothing to lose with either platform in that respect, why not set up your own mini-showdown between Pattern and Shopify? Let us know how it goes in the comments. Happy artsy, craftsy, or artsy-craftsy selling! The post Shopify VS Etsy appeared first on Merchant Maverick. To assist in your search, we’ve rounded up the top ecommerce software contenders. Two of our recommendations (Wix and Squarespace) began as traditional website builders for business or personal use, but have since added ecommerce capability. The others are ecommerce shopping carts at their coreÂ but have also made advanced online storefront-building capacity a major feature of the service. These include Shopify, BigCommerce, and 3dcart. Add-On Features:Â Many features may only come as add-ons from an app marketplace. While some add-ons are free, other apps you may want to integrate with your store (like shipping, marketing, or accounting software) are fully-fledged SaaS platforms with their own monthly subscriptions. Payment Processing:Â You’ll need to connect an online payment gateway to your store — usually a third-party processor like Stripe or PayPal — to accept payments from customers, so check out the available options that work with the platform in your country, and the processing rates charged. Design Template:Â Some website templates come free with the software, but premium themes typically have a one-time purchase cost. Web Development:Â While most ecommerce sitebuilders are DIY when it comes to getting things up and running, you may still decide to hire a developer or designer to fine-tune your site at some point. Customization Options:Â Go beyond admiring templates and work with a few yourself. In particular, explore the storefront editing tools that come with the software. Look to seeÂ if and how you can move elements within page layouts — there are varying degrees of flexibility in this area. Admin Features: Look at the options for configuring storewide settings such as shipping methods, currencies, languages, tax calculation,Â and sales channels. Also, consider the ways in which you’ll be able toÂ manipulate the specifications for individual products (pricing, SEO data, discounts, product variants/attributes, etc). Storefront Features:Â This includes how products are displayed, organized, and marketed to customers on your site, as well as all aspects of the checkout experience. Onboarding & Store Setup:Â All the software apps we cover in this article falls under a larger umbrella of “easy to get started,” but pay attention in your free trials to exactly how self-explanatory each step is, and to any additional guiding resources that are available. Dashboard Navigation & Feature Manipulation:Â Check your level of comfort with both finding and manipulating features like inventory and order management, discount creation, etc. Simplicity VS Flexibility:Â User-friendliness is a good thing, but make sure that the tools you need aren’t so basic that they can’t accomplish precisely what you want them to. Coding Skill Requirements: Â In most cases, the basics of admin and storefront customization will be covered without coding, but advanced customization can require advanced knowledge. Do your best to push the limits of non-coding customizability during your trial. Tech Support:Â Know what resources you’ll have if you get stuck or if something goes wrong with your site. Since online stores operate 24/7, you’ll probably want at least one support channel (email/web tickets, live chat, or phone) that’s open 24 hours. Shopify Lite:Â $9/mo.Â Embeddable cart, but no standalone store website. Our tests of both admin navigation and individual feature manipulation have demonstrated that everything is easy to find and use. If you do run into problems,Â ShopifyÂ offers phone, email, and live chat support 24/7 at all subscription levels — a rare support trifecta amongst ecommerce website builders. The company has also curated an impressive library of self-help articles, videos, and even full online courses. All in all, Shopify earns an A+ for user-friendliness. Shopify not-so-subtly guides you toward using Shopify Payments as your processor by rewarding you with reduced processing fees if you do and punishing you with an extra commission per sale if you don’t. If you’re not in one of the 10 locales currently supported by Shopify PaymentsÂ or don’t qualify to use the processor for another reason (such as risk level or type of products sold), you should probably take a closer look at some of the competing ecommerce platforms as well. Each bump in subscription level with BigCommerce gives you addedÂ features, but also implementsÂ annual revenue caps.Â Meanwhile, BigCommerce neverÂ charges an additional commission per sale,Â regardless of which payment processor you choose. You’ll have around 60 payment gateway options,Â one of which is Braintree (a division of PayPal), which gives access to discounted processing rates as you move up the BigCommerce subscription ladder. I would qualify BigCommerce’s backend as quite intuitive to use, although you might find it slightly more complex and detailed than Shopify’s interface. Part of this comes down to personal preference and experience, though. If you happen to run into a snag,Â BigCommerceÂ offers 24/7 phone, email, and live chat support at all plan levels, as well as good documentation and community forums. With over 120 themes (and multiple style variations per theme) available at the BigCommerce theme marketplace, you’re bound to find a good match for your store.Â Seven of the themes are free, and the rest range from $145 to $235 each. 3dcart shares pricing structure components with both BigCommerce and Shopify. Like BigCommerce, 3dcart subscription packages have revenue caps. Another similarity is that 3dcartÂ never charges its own fee per sale (and over 160 compatible payment gateways are available, some with discounted processing rates at higher subscription levels). For building a complete online storefront with the software, 3dcartÂ comes in at a lower starting price than both BigCommerce and Shopify (at just $19/month). You’ll also note that the 3dcart $29 plan accommodates twice the annual store revenue of the $29.95 plan on BigCommerce. For these reasons, 3dcart is often considered a less expensive choice. WixÂ never charges an extra commission per sale, regardless of which of the close to 20 gateway options you select for accepting payments. There’s a pretty big jump in the number of features between the Business and Commerce Basic plan, and a smaller jump in available features to Commerce Advanced. Another difference between the Business Plan and the two Commerce plans is that the Business plan comes with a 3% Squarespace commission per sale. If you’re serious about creating an ecommerce website with Squarespace, it will likely be worth it to have a Commerce package for the additional ecommerce-specific features and the elimination of the extra transaction fee.Â Meanwhile, you only get two payment gateway options with Squarespace (Stripe and PayPal), which will also charge their own transaction fees. In summary: Squarespace offers more no-code design flexibility than ShopifyÂ and less than Wix. However, if you’re comfortable adding CSS to your site, there’s an easy CSS editor available. The target audience for Squarespace amongst ecommerce website owners overlaps significantly with Wix’s demographic. 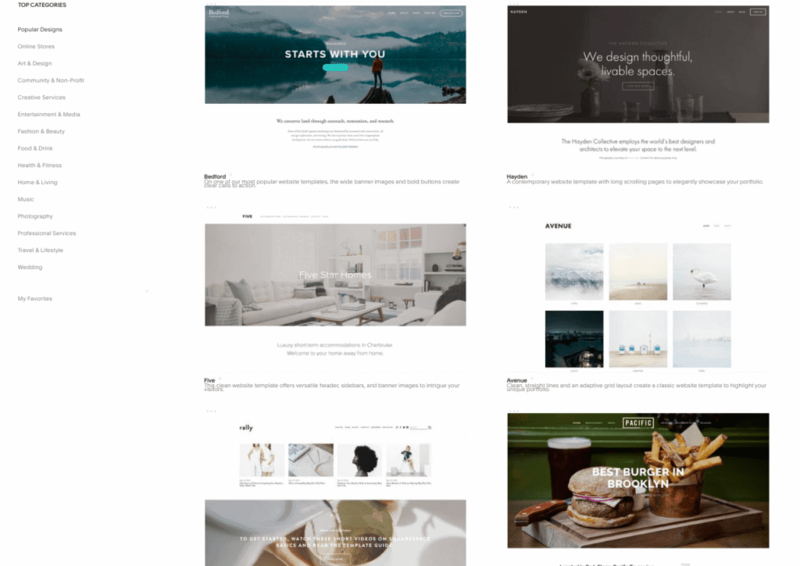 Both sitebuilders are great for smaller product catalogs with visual interest, but Squarespace is nice if you specifically want a posh, classy, or even minimalist vibe for your store. This sitebuilder is also great for those who enjoy the freedom to easily tweak a designÂ but don’t feel hemmed in by a bit of built-in structure for ensuring a consistent style overall. That said, anyone planning to scale their product and sales numbers dramatically over time should probably stick with one of the three ecommerce workhorse platforms.Â There’s a reason sitebuilders like Wix and Squarespace cap their ecommerce plan subscriptions at under $50/month, while platforms like 3dcart, BigCommerce, and Shopify can charge upwards of $200 per month for their best ecommerce packages. You’re usually paying for a larger quantity and better quality of features that help you manage the complicated logistics of selling online. It’s a safe bet,Â in this case, to use pricing as a general guideline for the ability to shore up and scale your backend functions as your store grows by various dimensions. Still, Wix and Squarespace would not be included here at all if they weren’t both excellent options for smaller stores. The post Find The Best eCommerce Website Builder For Your Business appeared first on Merchant Maverick.